The Female Angle: Saltwater fly fishing heaven. Haa Nee Naa Lodge invites you to join our first annual Couples’ Week. Join us for an exciting week of Coho action on the fly with our special guest instructors, Peter Morrison & Adrienne Comeau. Peter Morrison is a former professional angling guide and a pioneer salt-water fly fishing angler, most notably in the quest for Pacific Salmon. Peter is also a certified Master Casting Instructor and is looking forward to entertaining audiences with casting lessons, fly tying demos and slide presentations which draw from his years of experience targeting Coho on the fly. After several years at Haa Nee Naa Lodge, Peter will be joined by professional Guide and Instructor, Adrienne Comeau for this wonderful couples’ event. Adrienne has grown up fishing on B.C.’s West Coast as a self-proclaimed fishing fanatic. With her passion for fly fishing, years of experience in the industry and unique female perspective, Adrienne promises to engage and enchant both seasoned anglers and those new to the sport. This trip allows couples to share in the thrill and passion of this exciting sport, while enjoying the natural beauty that surrounds them in a stress free environment. Come and relax with good company and enjoy the Lodge’s first class facilities and hospitality while immersing yourselves in the knowledge of these two experts. 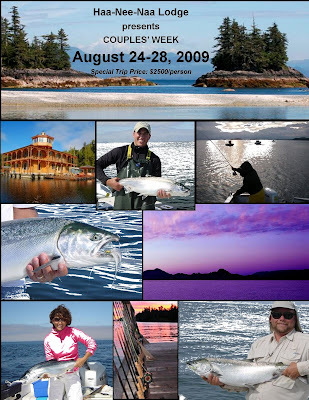 This special package includes workshops and seminars covering the many aspects of saltwater fly fishing on the Pacific North Coast and enables couples to set their own pace, meet new friends, and learn a few new tricks along the way. Please give us a shout or drop us a line for more information.